We always welcome Tim O’Rourke back with open arms, and the Beautiful Immortals series 2, Vampires of Maze part one, was definitely worth the wait! Vampires of Maze book 1 follows the release of the Werewolves of Shade short story series, and rewinds to the event of the Were characters we’re already familiar with coming to England with Julia, the Wicce, and puts them in the middle of the war between the vampires and werewolves. Note: This ends on an unbearable cliff-hanger. Part two will be published within the next few weeks. I know fans of Tim O’Rourke have been waiting eagerly for this short story series since Werewolves of Shade (series 1) ended. And, what a great start to the series! Not only does it have a great start, which reminded me of elements of O’Rourke’s Moonlight trilogy, and an adventurous and mysterious feel like the phenomenal Keira Hudson series, but the reader is subject to a great horror feel and a terrifying cliff hanger! I love how this series takes us back to the days when familiar characters in Rush, Rea and Calix arrive in England for the first time with Trent and Julia. If you have read series one already then you will already be acquainted with these characters having already settled in Shade. However, it was clear from Werewolves of Shade that this journey that they are embarking on is not straightforward due to the war between the weres and the vamps. It is fascinating for a reader, and I imagine for the author too, to go back and find out more about the war, more about Julia, the Wicce, and how she handles both the weres and vamps. Julia has been sent with a spell book to negotiate between both parties. She doesn’t want the violence, the war, but peace. Travelling with the weres meant that she was already beginning to familiarise herself with them, but in order to negotiate successfully she knew she would have to keep her distance from them. However, with the speedy attacks that seem to come upon her and the weres she is travelling with, will she have a chance to negotiate? Or, even a chance to live? The interaction between the characters adds to the mood of the story. With Trent and Rea having been lovers in the past, there is some jealousy from Rea towards Julia as Trent looks out for her and begins to listen to Julia’s opinion. Calix is always candid, argumentative and possibly a tad immature, seeming to be the awkward one who wants to be brash and do things his way. His character actually reminds me of James Remar‘s character, Ajax, in the movie The Warriors. He is flirtatious in an abrupt kind of way, but there is a very slight soft spot in there somewhere. And, between Calix and Rea’s back-answering personalities, and Rea’s smoking, they also have a little bit of Potter in them from O’Rourke’s Keira Hudson series. Meanwhile, Calix’s brother, Rush, is a little more laidback with a kindness about him. Although a paranormal, there are always elements of horror in O’Rourke’s work. Vampire’s of Maze is no exception, especially with the quick, gritty attacks from the vamps and an absolutely terrifying cliff hanger! It’s a great read for this Halloween season! Not to mention the usual suspenseful atmosphere that the author creates with great vivid imagination and action sequences! Vampires of Maze part 2 will be released very shortly. 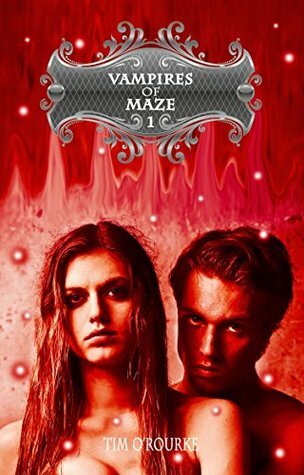 Vampires of Maze part 1 was provided by the author in return for a fair and honest review. You can find Vampires of Maze (Beautiful Immortals series 2, part 1) by Tim O’Rourke at Amazon UK and Amazon US. You can catch up with all my reviews on the Beautiful Immortals series one, Werewolves of Shade by clicking on the titles below! This entry was posted in Horror, Mystery, New Adult, Paranormal, Review, REVIEWS (ALL) - Reverse Chronological Order, Romance, Thriller and tagged Beautiful Immortals series 2, book review, fantasy, horror adventure, paranormal, paranormal-romance, short story, Tim O'Rourke, Vampires of Maze part 1.